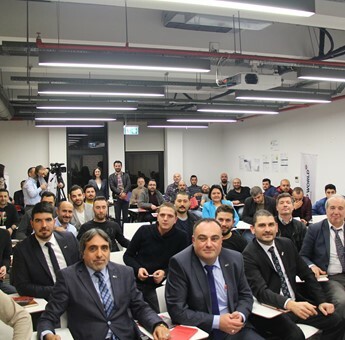 The members of Kocaeli Customs Association were provided with Occupational Safety Training at the port by the Health & Safety and Environmental Experts of DP World Yarımca. Refik Bora, as the president of Kocaeli Customs Association pointed out we consider that it is a gesture of respect that DP World Yarımca, which shows its corporate structure and the importance it places on service quality at every turn although it has just started to provide services in our region, is hosting the HSE training for the employees of companies operating in the field of customs consultancy. For this reason, I, as a part of this business field, would like to thank all of the managers who provide us this opportunity . After the training was completed, Refik Bora, presented a “plaque” to İsmail Karaçam – Health, Safety and Environment Manager of DP World Yarımca -, and the participants were awarded with the certificates. DP World Yarımca, providing services as a container station in Marmara Region, commits itself to be the leader for expanding the awareness on Occupational Health, Safety and Environment within both regional and nation-wide ports.